Masala Puri Chaat is most fascinating street side snack with almost iconic status in southern region of India. This is a spicy dish that has originated in Karnataka and has become popular in most regions of the country. It’s freezing cold and gloomy outside which only mean keeping cozy indoors and indulging in some comfort food. This insanely delicious masala puri chaat will warm you right up and uplift your mood. Masala Puri is generally spicy with a hint of sweet and tart and has assortment of spices and chutneys. This dish is served with peas gravy as topping over crushed puris along with green chutney and sweet tamarind chutney. Finished off with finely chopped onions, tomatoes, thin sev and coriander. The end result of this chaat makes the elaborate process of peas gravy is all worth the time and effort. This is probably one of the best snacks to devour leaving with an after taste that is hard to forget just like other street side chaats bhel puri, sweet potato chaat, dahi papdi chaat, masala corn. Check out green chutney and sweet tamarind chutney recipe in this blog. 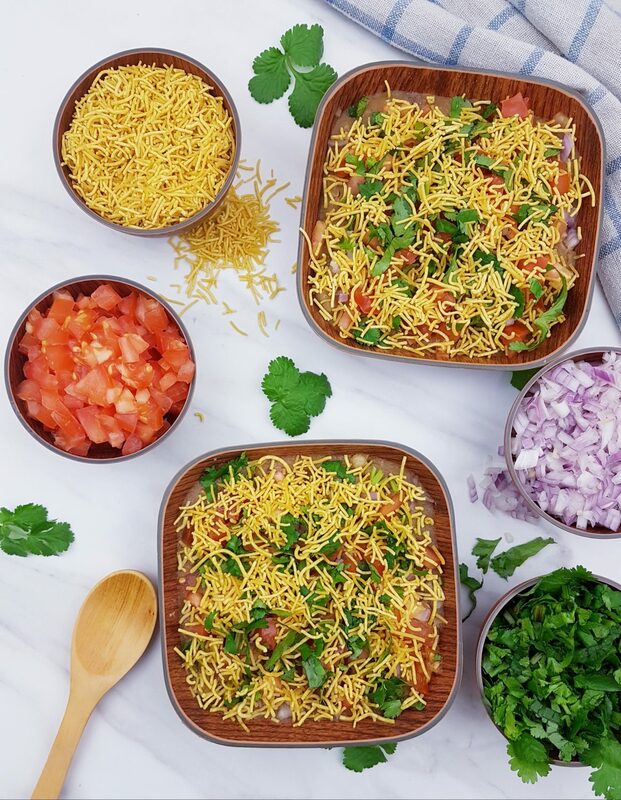 Is masala puri chaat adaptable? 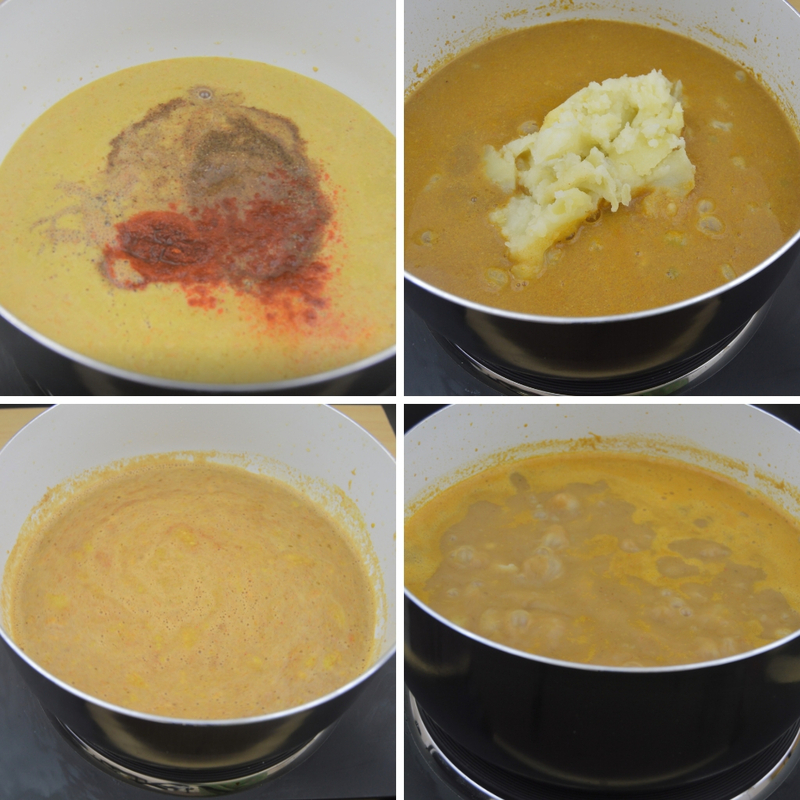 This recipe is totally adaptable according to your preferred taste. You could scale down dry spice mix to make the gravy medium hot. This dish can be adapted to enhance any flavours. If you don’t prefer tangy and sweet flavour, do not add tamarind chutney. You could top up this chaat with pomegranate pearls and toasted peanuts for extra crunch and flavour. Potato: 2 medium size, peeled boiled and mashed. Wash and soak dried green peas overnight. 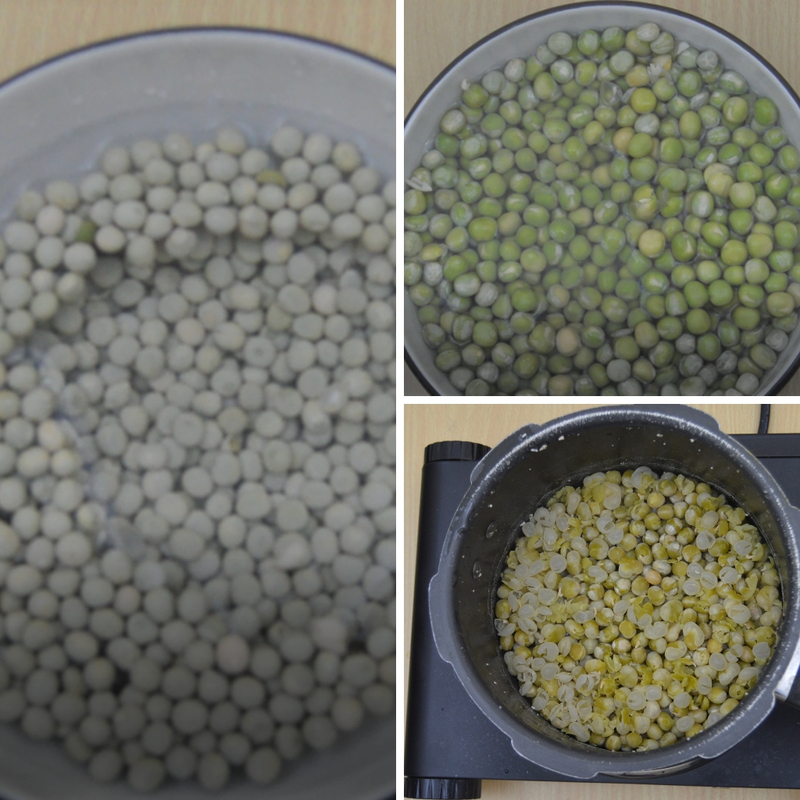 Drain the water and cook peas with 3 cups water in pressure cooker for 3 whistles or until soft and keep it aside. Grind all the ingredients mentioned under “for dry spice blend” in blender to powder and keep it aside. Add onions and cook until soft, now add green chillies, ginger garlic paste, tomatoes and cook until soft, turn off the heat. Allow the veggies to cool down completely, grind to a smooth paste. Heat the same pan, add the ground onion tomato paste, water, ground spice mix, coriander powder, garam masala, chilli powder. Also add mashed potato , salt. Stir well and cook on medium high heat for 10-15 minutes and turn off the heat. Crush 5-6 puris and place them in a bowl. Add 2-3 ladles of peas gravy. 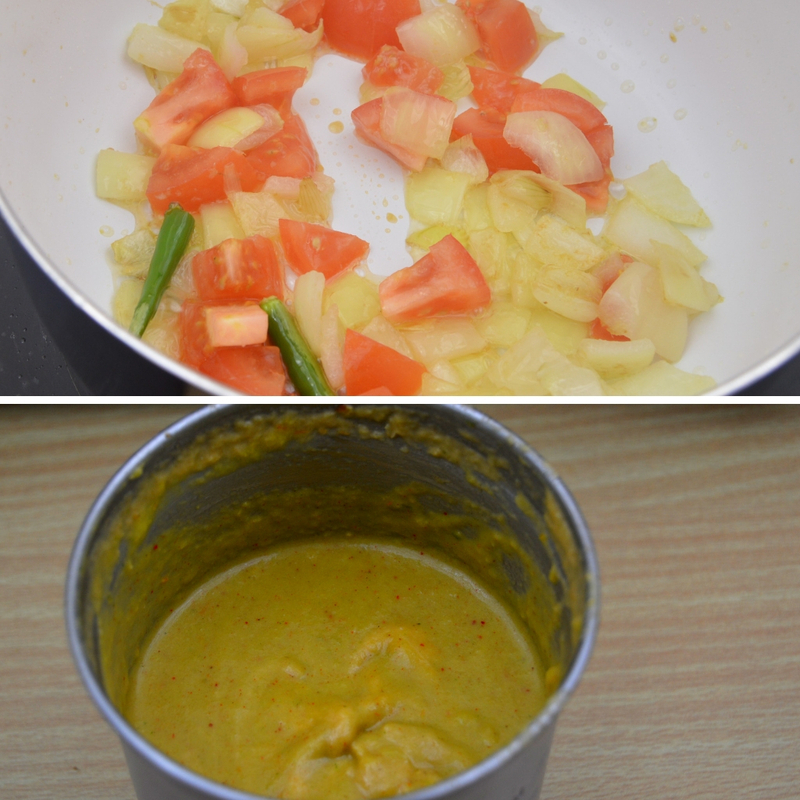 Add a tbsp green chutney and a tbsp sweet tamarind chutney. Now add a pinch of chilli powder and chaat masala. Top it with handful chopped onions, tomatoes, coriander and sev. Enjoy the hot and spicy masala puri chaat. 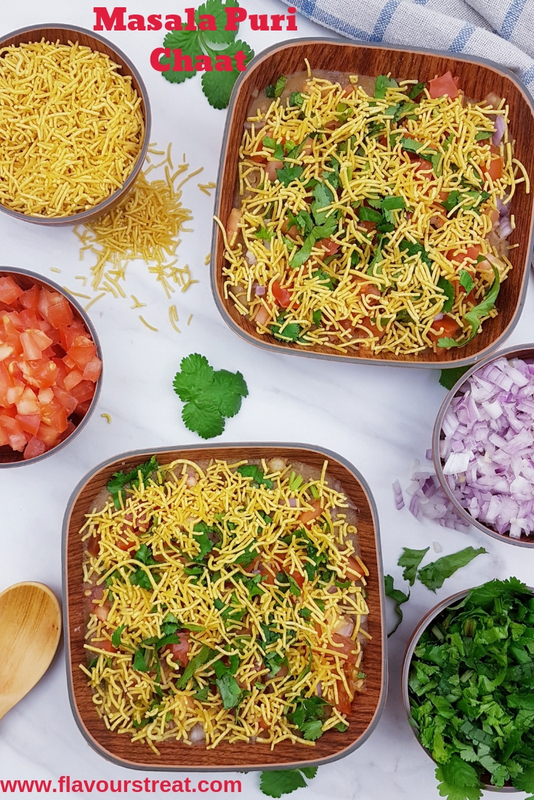 Assemble masala puri chaat just before you serve to avoid sev getting soggy and gravy getting cold. Adjust the spices as per your preferred spice levels. To make this snack little quick, make ahead green chutney, sweet tamarind chutney and refrigerate or freeze them. I have used store-bought golgappa puri and sev, you may use home-made puri or swap it with papdi. You can use home made sev as well. This dish tastes best when served hot. Do not forget to reheat peas gravy if you prefer to make it ahead to serve later. Add more or less puris, chutneys and rest of the toppings as per your preferred taste. 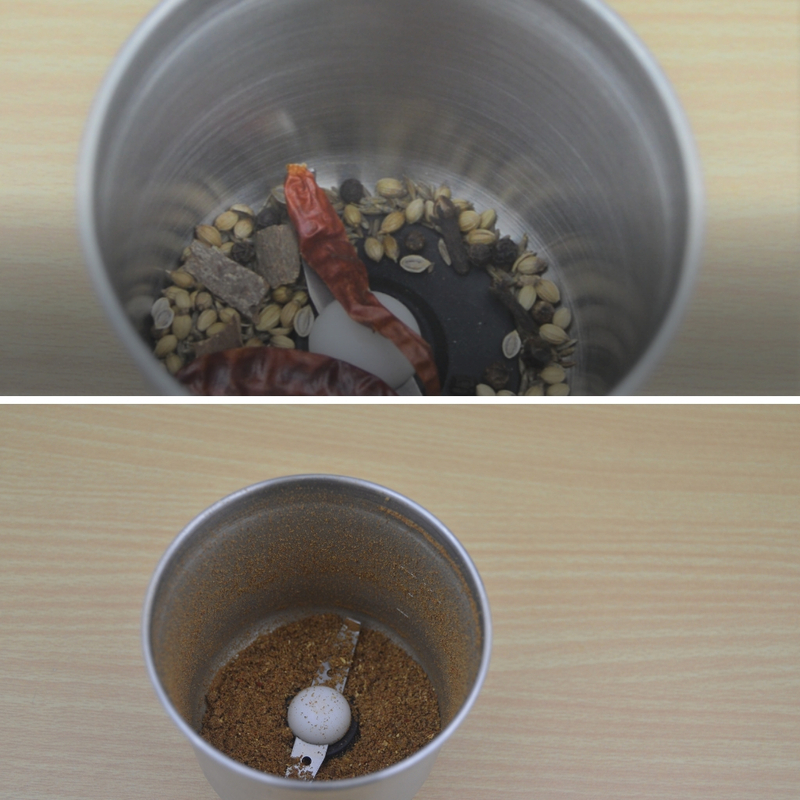 Spices may be dry roasted before grinding if you prefer intense flavour. 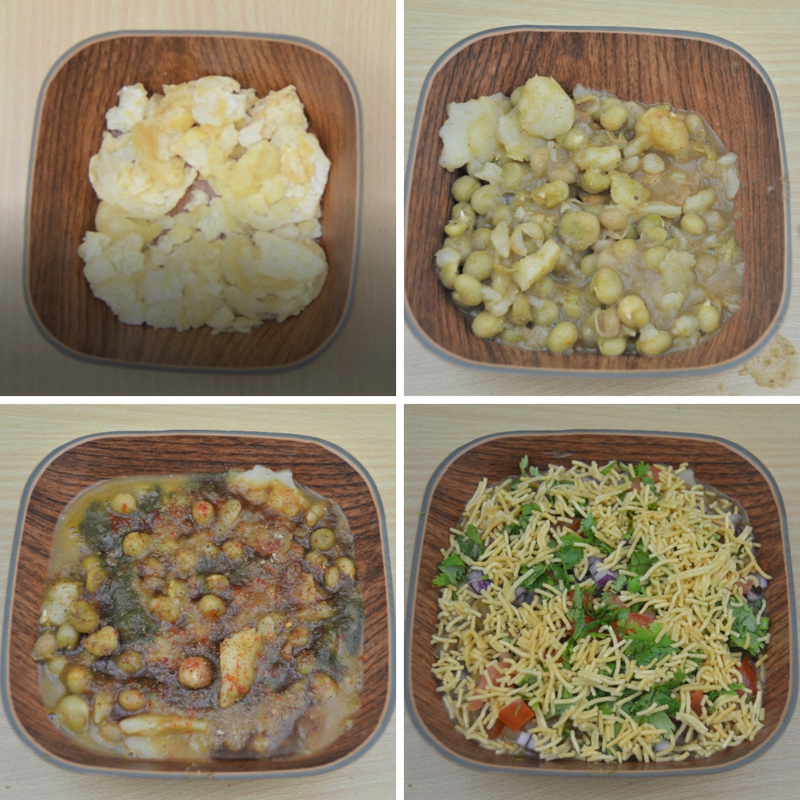 Potatoes can be cooked along with peas in pressure cooker to save time. I have used the left over boiled potatoes in this recipe. You may have to cook peas for 1 or 2 whistles more/less than mentioned in this recipe depending on the type of water used. Cooking time depends on hardness of water used. You may swap dried green peas with fresh green peas but chaat will not be as tasty as with dried peas. Masala Puri Chaat is most fascinating street side snack with almost iconic status in southern region of India. This is a spicy dish that has originated in Karnataka and has become popular in most regions of the country. It's freezing cold and gloomy outside which only mean keeping cozy indoors and indulging in some comfort food. 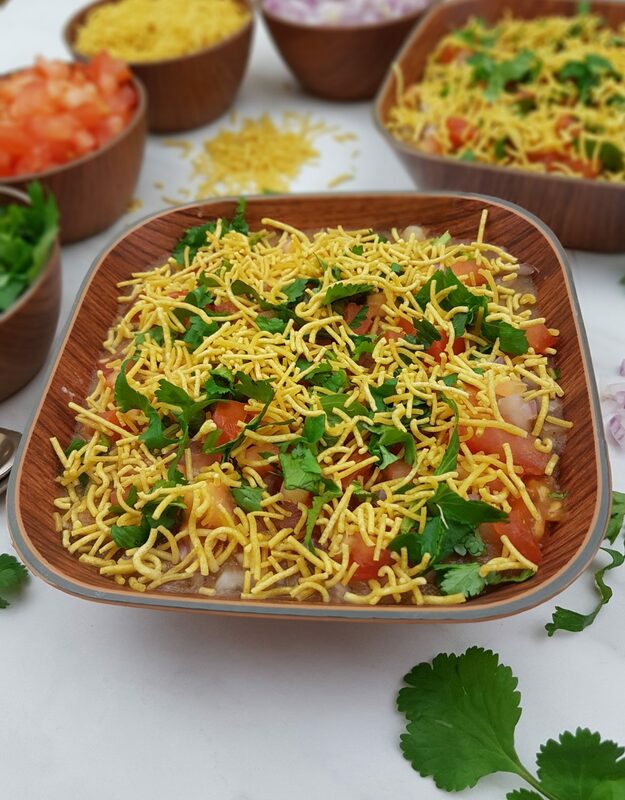 This insanely delicious masala puri chaat will warm you right up and uplift your mood. Grind all the ingredients mentioned under "for dry spice blend" in blender to powder and keep it aside. I have used store-bought puri, you may use home-made puri or swap it with papdi. Who will say no to this tempting, yummy and delicious masala chaat. I miss all these chaat foods here in UK. Thanks for sharing in detail dear. So true Pavani even I miss chaats a lot and so I started to make them at home whenever I crave to have them. Never say no to chaat, it’s SIN 😉 jokes apart, chaat is my weakness and my daughter’s, I forget the world when I eat chaat. yours sounds delicious. Haha infact chaats are like prasad never say no isn’t it!!!! Chaats are my weakness. This platter looks so flavoursome., do send some. Chaats are always a weakness to us Indians…. wish I could serve you!!! Very well said Ruchi, I haven’t met anyone till now who doesn’t like chaats. Yummy! I am starving here it is past my lunchtime now my rukhi sukhi roti sabji does not sound as goos. Oh dear!!! wish I could serve you this chaat….. just the name chaat is enough is tempt us at any time is it!! Chaat is always a winner at Indian’s home. I agree with you this snack is perfect to enjoy during winter and rainy days. The chat looks so tempting… can’t resist. A treat for tastebuds. An absolutely fav of mine. I do prepare this at home. Lovely share! Glad to know you like this chaat and make it at home. Absolutely true I totally agree with you. Masala puri is an all time favourite chaat for anyone from Bangalore-Mysore regions. Your recipe is quite different from mine with the addition of spice blend. Would love to try it sometime. Glad to know different version of this dish. I will check out your recipe soon…. I’m always in for any kind of street food….I’m drooling over this mouthwatering chaat…Loving it!! Feel like inviting myself to your place to have this irresistibly delicious masala puri, havent had chaat foods. Seriously your masala puri is torturing me. My mouth is literally watering here..
What a treat to taste buds. This is such a yummilicious post and I must say it’s favourite of almost everyone. So true Lata, indeed it’s a favourite dish of almost every chaat lovers. What a mouthwatering chart recipe! Perfect for get togethers at this time of the year! Oh yes it is a perfect party snacks and surely a winner dish!!! So yummm .. suddenly missing Mumbai and the chaat stalls there!! loved your recipe and clicks!! Even I miss chaat stalls and so I have started to make them at home whenever I crave. Indeed it is favourite street food of anyone who try it.